Can cereal rye cover crops suppress weeds? A question recently arrived in my email inbox: What is the potential for weed suppression when using cereal rye cover crops? To help answer the question, I reached out to Dr. Bob Hartzler, ISU Extension Weed Specialist and Professor of Agronomy, and Meaghan Anderson, ISU Extension Field Agronomist. There is pretty good evidence that a thick, consistent stand of cereal rye can effectively suppress winter annual weeds. In soybeans, rye with even cover and a lot of biomass (>4000 lb/ac) may provide some early season weed suppression, but generally the weeds will begin to emerge as the cereal rye breaks down. Ann and I saw this first hand yesterday (photos below) when visiting our long term rye site in Page County to collection biomass samples. In the cereal rye strips only one or two field pennycress plants were found. However, in the neighboring strips without cover crops, the winter annual weed was thriving. No evidence yet that cereal rye will help control perennial weeds, but it may help suppress perennial weeds germinating from seed or perennial rootstalks like dandelion, Canada thistle, field horsetail, etc. Perennials normally develop from established root structures with a lot more energy reserves, so they are going to be tolerant of the competition from the cover crop. If repeatedly used, cover crops could provide some suppression of things like dandelion and such. Whether or not it provides some suppression or control of resistant weeds would depend on whether those weeds fall into the categories listed above (early-season weeds or winter annuals) and whether the cover crop stand is consistent. To keep up to date on weed issues, follow Dr. Hartzler on Twitter @ISUWeeds! The October ILF webinar contained some great information about weed management when using cover crops. Bob Hartzler, ISU Extension weed specialist, presented findings from a study done by graduate student Meaghan Anderson. 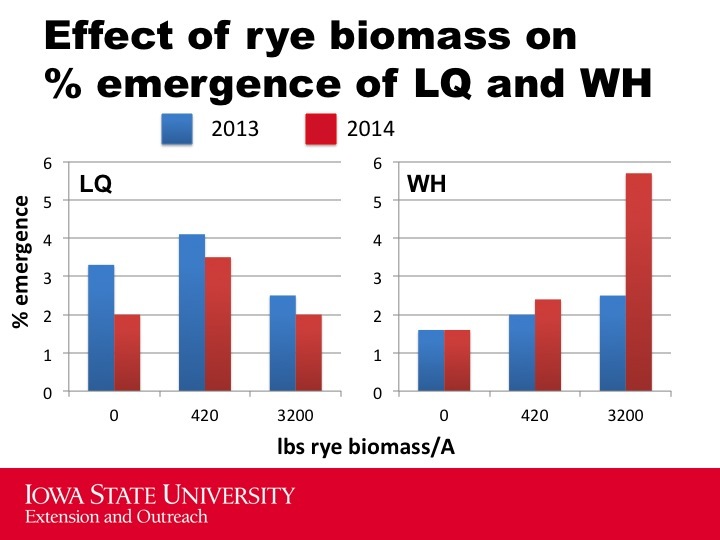 Planting more rye to create more biomass did not correlate with the amount of lambsquarters (LQ) or waterhemp (WH) weed suppression. 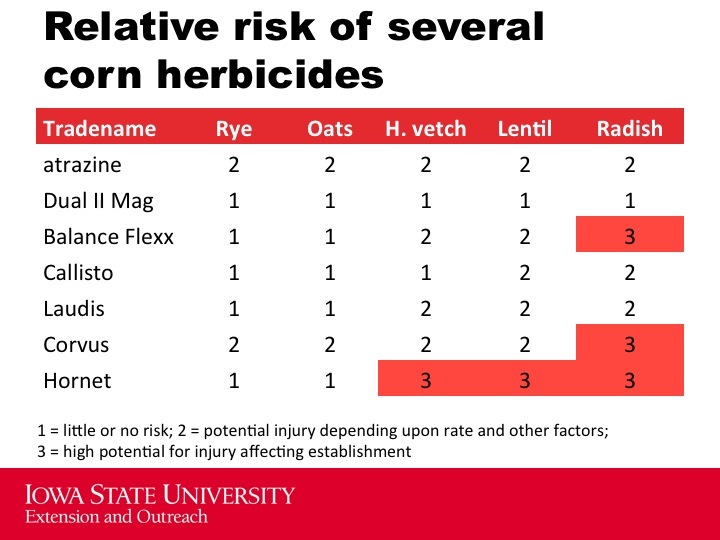 The cover crop most sensitive to residual herbicide was radish, especially after corn, and the least sensitive was cereal rye. Watch the archive recording of the webinar to get details and to hear Hartzler’s factors to consider when adding a cover crop to your corn-soybean rotation.